Sam Francisco, among other places, is home to a new billboard from Microsoft, advertising, of all things, Excel. Actually, they are advertising the Surface and Surface 2. The selling point is that these devices come with Office, which comes with Excel. Trust me; it gets better. Did you happen to notice something just a little off? I didn't either. But others did. The thing that is a little off happens to be the calculations. Oops! 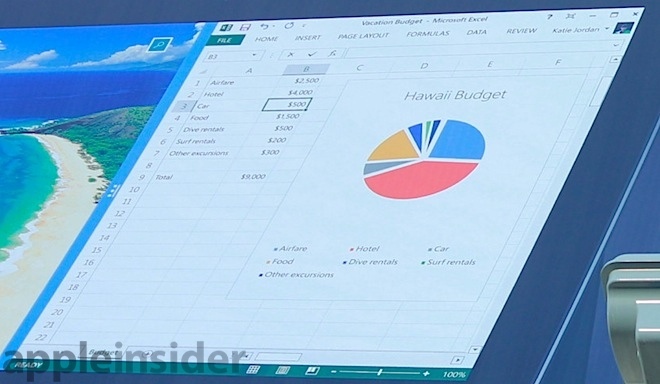 Pictured is a Surface tablet with Excel doing a simple summing of seven items. The math is very simple. You can total the numbers as quickly as you can scan them. Apparently, Excel can't. In the ad Excel gives you a total of $9,000. The correct total is $9.500. This was supposed to show how much better a productivity tool the Surface is over the iPad. Shaw added, "let's be clear - helping folks kill time on a tablet is relatively easy. But helping people be productive on a tablet is a little trickier," and ended with a jab at the "struggling, lightweight productivity apps" Apple is now offering at no additional cost. Ahhh! That's so much better. Even if the calculations had ended up being correct, Excel's output is so much uglier than the worst thing you can do in Numbers on the iPad. Still think you need Office on your tablet to get work done? I used neither mouse nor keyboard nor instruction manual to throw this together. As for the calculation error, I doubt that Excel made a mistake. This feels like human error to me. I suspect that the people doing this ad were given a Surface, and left to figure out how to use it. I'm betting they couldn't figure out how to sum a column of numbers, so they just did the math themselves, and entered the wrong answer manually. Besides the fact that Microsoft is farming this stuff out to the lowest bidder, and that there is no one in Microsoft's organization that gives a hoot about the details, this tells us that Excel on a Surface is too cumbersome to actually use for anything productive, and that people forced to try to use it would rather fake it, than actually use a Surface for anything productive. The iPad, on the other hand, mops the floor with Microsoft's productivity device.